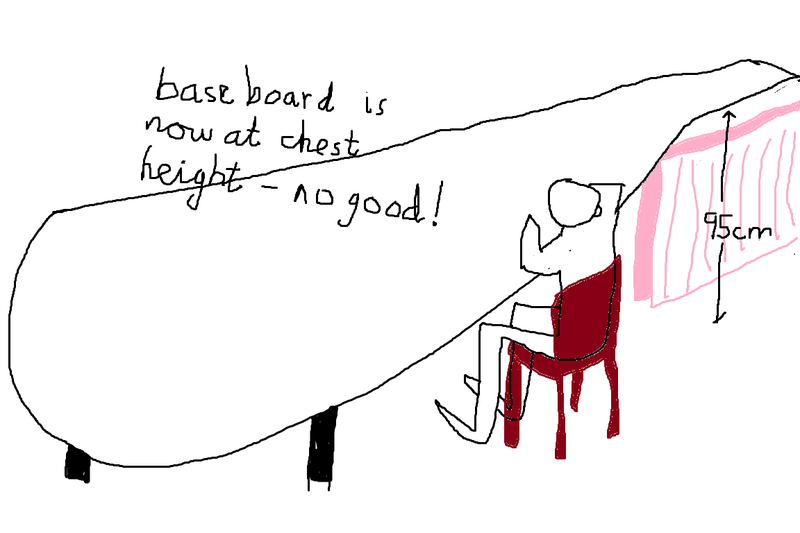 How high should the board be? Certainly, it has to be high enough to clear the central heating radiator. But if it's too high then I won't be able to sit comfortably at it unless I use a high breakfast bar type stool/chair. Also, if it is too high then young children will not be able to see it. On the other hand, the higher it is the more can be stored beneath it and the easier will access be to the underneath if a wiring adjustment has to be made. Mmmmmhhhh! At the moment it is 70cm high. The radiator is 81cm and a further clearance of 15cm will be required, I would think. That would take it to 96cm. But sitting in an ordinary chair, the edge of the board would cut across my chest. Will have to consider the high stool/chair option. Wondered if there was any youTube footage available of the Japanese reggae group, Dry and Heavy. Indeed there was, from an outdoor festival somewhere in Japan. What impressed me was the demeanour of fans and musicians. One of the long-term members of Dry and Heavy chose this moment to announce his retirement from the band after many years. He made an emotional and what appeared to be eloquent speech, full of gravitas. The crowd listened respectfully and sympathetically. The whole set up was very civilised. I would never even consider going to an European festival. The conditions are filthy; toilet facilities vile; fan behaviour bound to reflect the criminal pattern of the society from which the fans have come; and probably a lot of unnecessary jostling. The Japanese festival looked more like an outdoor opera at Glyndebourne. Here is the youTube link. Not worth photographing - an utterly dismal bacon sandwich.